I remember once maintaining some application, where I found the exactly same block of code (with the exact same syntax error (*)) 25 times throughout the codebase. (*) The error was a function call with missing the parans, which in C is a legal expression, but the function is not actually called. 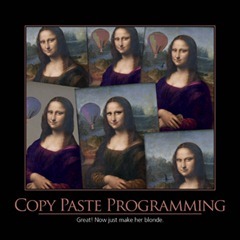 Copy and paste programming is one of the worst programming style ever - especially when it's about copying some code, pasting it somewhere, and then using find and replace on that code. 50% of the times this will not work as it should, and in 50% of these 50% it takes much more time to fix the problem in the code than to write the code from scratch. I am not against copying a line or two and then testing the immediately, but copying a whole logic from one place to another is asking for trouble and for project delays! With way, when someone goes to maintain funcA(), they can see all the option already available, so instead of creating yet another one, they can consolidate one one or two. We did. I was just surprised to see that the duplication had come about in the first place. Often the situation goes like this: the two places uses very similar logic and much of the identical code. However, one place need do some extra initialization and some extra cleanup which refers to some extra parameters. So to factor them into a function or class, we often faced with the dilemma of creating and maintaining extra interfaces of either the extra callbacks or extra parameters, which have no use and puzzling by studying in one applications. And study the function and class is extra difficult as both applications need be considered. And as features creeps in, we'll quickly find not two, but three and more such situations. As we often end up in delivery critical situation, every time concerned with update and debug an interfaces that serves many faces are not quite fun. Copy and pasting is bad, bloated interfaces are not good either. We need better programming facility than functions and classes.